I outlined in a previous blog post the work we have carried out over the last several months to improve the WiFi service on Campus. We’ve been carefully monitoring the service since the start of semester, and over the first few weeks it performed well and we were seeing it handle a much higher load of users successfully when compared to the same period last year. We had good feedback from those users we were in contact with. I’m aware, however, that over the past two weeks in particular there have been some problems which have affected people trying to connect to Eduroam over WiFi on our Campus. Once they are connected, the connection is good and performs well, but there have been a number of reports of people not being able to connect from time to time. The problem seems to be that the attempt to connect either hangs, or says that it can’t connect, or asks for a password. IT Services engineers have raised this as a high priority issue with the manufacturer, and they currently have an engineer on site from Europe backed up with specialist advice from the USA. They are able to trace what is happening on the system and are currently working on a number of options to address the situation. I’m sorry that people are experiencing some problems at the moment – we know how important the WiFi service is and we have stressed to the manufacturer the urgency of getting our WiFi system back to a stable state as quickly as possible. If you do encounter difficulties in connecting meantime, the tips provided in the previous blog post may still be useful to help you get connected. IT Help Desk – Happy to Help! The IT Help Desk has a new home this year. Actually I think it’s had a new home every year for the last few years on the back of all our moves and changes to Campus buildings! It’s now located in the new Georgina Scott Sutherland Learning Centre in the Aberdeen Business School – the area that used to be the Library for those of you who have been here for a while. You will see the Help Desk located in the middle of the Learning Centre. At the time of writing, they are using temporary furniture but we are expecting a proper counter and some new partitioning in the next few weeks to smarten it all up. Please do use the Help Desk – they are there for staff and students, and will be very happy to help you and provide advice on use of the University IT services. If in doubt – ask! If you are having problems, it really helps us to know so that we can identify commonly occurring issues and sort them out – not just for you but for everybody else. You can visit the Help Desk, or call them on 2777, or email them at ithelpdesk@rgu.ac.uk . Remember you can also find information and guidance on the IT Help Desk Pages. 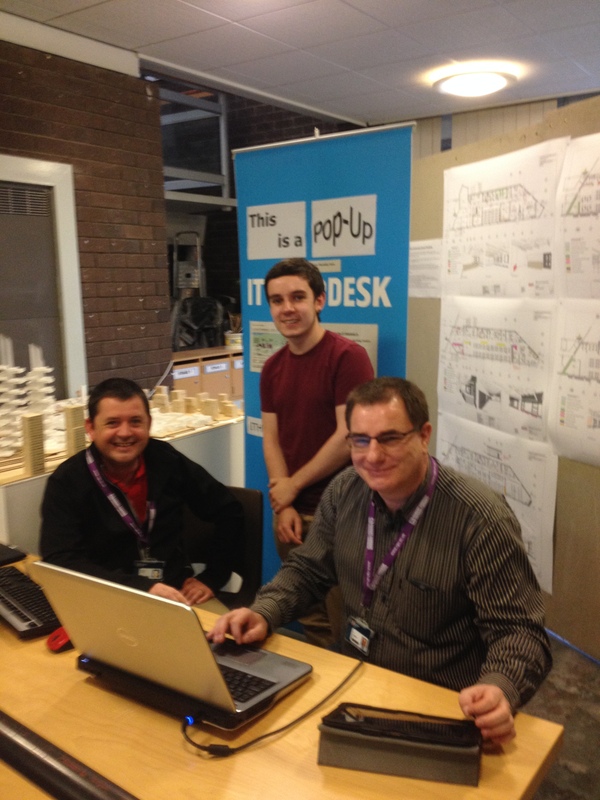 If you want to know what a popup help desk looks like – here’s one in action yesterday in Scott Sutherland!